China has been a major contributor to the global growth story in recent years, and has had a big impact on developments in foreign and emerging markets. As we’ve noted in previous commentary, we have been seeing some weakening in growth outside the United States while growth here remains strong. A 30% drop in the Chinese stock market, a sharp reversal in the Chinese currency, and slowing output growth all point to accumulating foreign sector weakness. 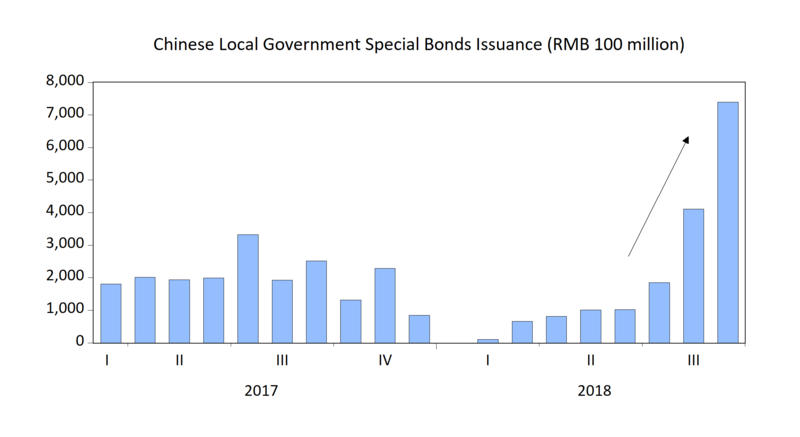 Within China, the Chinese government has increased stimulus as evidenced by a recent surge in local government bond issuance (chart, below), and the Peoples Bank of China (PBOC) has responded by cutting the amount of cash banks must hold as reserves. In a recent interview, PBOC Governor Yi Gang affirmed his belief that China’s fundamentals were “sound” and laid out a series of steps being taken to provide liquidity to the real economy. These steps include local government and central bank aid in funding local business, and PBOC support aimed at encouraging more business loans throughout China’s banking system. We are yet to see the impact of these measures given recent soft reports on output and industrial production. We continue to see this year as a transition year with divergent paths emerging in different parts of the world. Most global equity markets, by and large, are solidly negative for the year measured either in local currency or dollar terms, but our markets are hanging on to small gains. Compared to the struggles of the rest of the world, the United States continues to experience good growth, low unemployment, firming inflation, and rising interest rates. An important question from here is whether or not the United States can continue to go its own way without the support of positive momentum among our major trading partners. 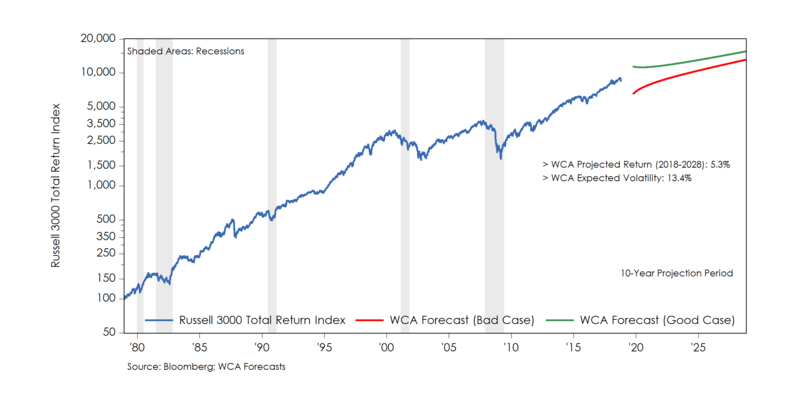 The chart below provides some visual sense of what a “bull” and “bear” case might look like for the U.S. equity market in the context of our current long-run return and risk assumptions. 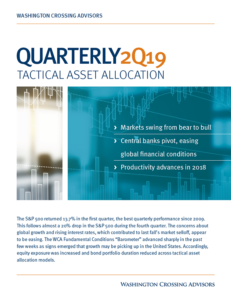 Under our current return and volatility assumptions, we envision a long-run, projected “base case” total return for United States equity markets of about 5.25%. A better and more accurate depiction of this forecast should capture some measure of uncertainty. 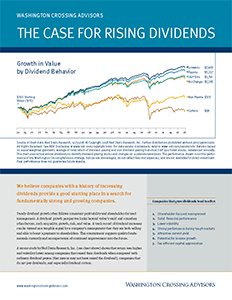 The chart below attempts to incorporate such a range of outcomes, by incorporating historical risk measures around our “base case” 5.25% long-run equity market return projection. In this case, we think a -22% downside in a “bear” case and a +33% upside in a strong “bull” case are both within the realm of possibility over the short-to-intermediate term. Moreover, these are simply our estimates and it is important to recognize that actual outcomes could differ materially from these or any such forecast. However, we believe that it is helpful to consider a range of potential outcomes, if only to avoid complacent and biased thinking. Beginning this month, we are moving our monthly updates to the WCA Fundamental Conditions Barometer to the start of each month from the middle of each month. When updated, we anticipate continued strong showing from domestic economic data, coupled with weaker trends outside our borders, to keep our barometer reading near the middle of the range. Moreover, the recent pickup in market volatility could also produce some near-term headwinds for the barometer as we move toward year-end.